Fusioo is a collaborative online database that helps your team get work done, in one place. Fusioo’s flexibility allows you collaborate with your team members and create your ideal workspace, without writing any code. Apps can help you track and manage the information flowing through your team’s daily workflow. You can create Apps to track and manage Projects, Tasks, Internal Articles, Sales Leads, Events, Client Feedback, you name it. To learn more about Apps, make sure you check out the following detailed guide: What is an App? Fusioo helps you collaborate with your colleagues, clients and independent contractors in one place. You can start using Fusioo’s granular role based permissions to control Role access levels. You can restrict App, Field and Dashboard access for certain Roles. This makes Fusioo attractive for larger teams, whereby you can share certain projects and tasks with clients and external contractors without divulging sensitive information. Ready to get started? 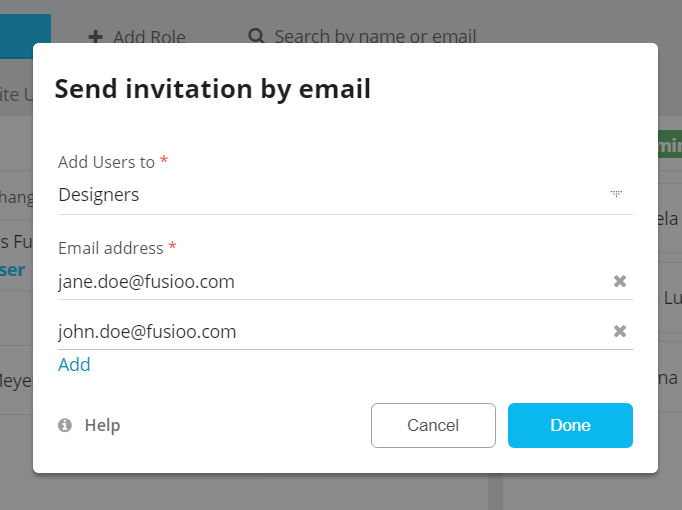 Learn how you get your team up and running and invite your colleagues, external contractors and clients on Fusioo. Using Google Chrome as your browser? You can start launching Fusioo right from your desktop. Fusioo has been engineered to work as a Single Page Application (SPA). Most clicks in Fusioo result in dynamic updates to a particular page, rather than a full reload of the page in context. This architecture improves the overall performance and helps you maintain your workflow in a single tab. This makes Fusioo a great candidate for being used as a desktop application. To learn more about how you can use Fusioo as a desktop application, make sure you check out the following guide: Using Fusioo as a Desktop application.